Much like how the film deals with the theme of legacy, because of how the main character deals with living with his father's family name, Sylvester Stallone becomes able to pass on the legacy of his own character to a new and exciting batch of talent. Creed follows the story of the son of one of Rocky Balboa's most famous opponents, Apollo Creed, named Adonnis (Michael B. Jordan), who has never met his father yet still has his boxing running in his blood. Looking to become a professional fighter while struggling to build his own legacy apart from his father, Adonnis turns to Rocky (Sylvester Stallone) for training and they form a bond along the way. First, I'll get into the direction by Ryan Coogler. When he and star Michael B. Jordan did Fruitvale Station a few years ago, they both created filmmaking magic and here it is no different. Even though this film is a studio pic, what Coogler is able to accomplish is giving it the spirit of an independent filmmaker. In the hands of a lesser director, it would've just been a stock boxing movie with the director simply pointing the camera and getting the movie filmed. But Coogler puts great focus on the aesthetics of the filmmaking process like, for example, how the film's boxing matches are different from one another because he films each one differently. One match is done in a long tracking shot and the final one involves other editing techniques. Also, because he wrote the screenplay, since it depicts blacks as main characters, he relievingly leaves out racial politics typically incorporated in studio films with blacks at the center. They're not reduced to being stereotypes or portrayed as martyrs and I loved that. The characters are also amazingly brought to life by the actors portraying them. Michael B. Jordan proves a strong case as to why he deserves to be one of the biggest stars in the game. The genius of his performance is that not only does he exude star charisma, but he captures the furious lost soul that his character is through not just his eyes, but also his punches. It's a subtle yet three-dimensional mix of physicality, charm, and depth. Tessa Thompson is given the "Adrian" role as Adonnis' love interest Bianca, who is a singer that (*spoiler alert*) is slowly succumbing to going deaf. But Thompson gives a very grounded performance as she doesn't play the character as a martyr, but rather someone with the mindset of "might as well do what I love while I can." But one standout I have to mention is of course, Sly Stallone as Rocky. Even though the franchise, and character, is his, Stallone was very complimentary to not only pass the reigns onto a new director, but not to upstage Jordan. Stallone still possesses the same charm associated with Rocky, yet this time around, he is not afraid to incorporate a layer of darkness. He had me in chuckles yet at one serious point in the film, I thought he was going to make me cry. 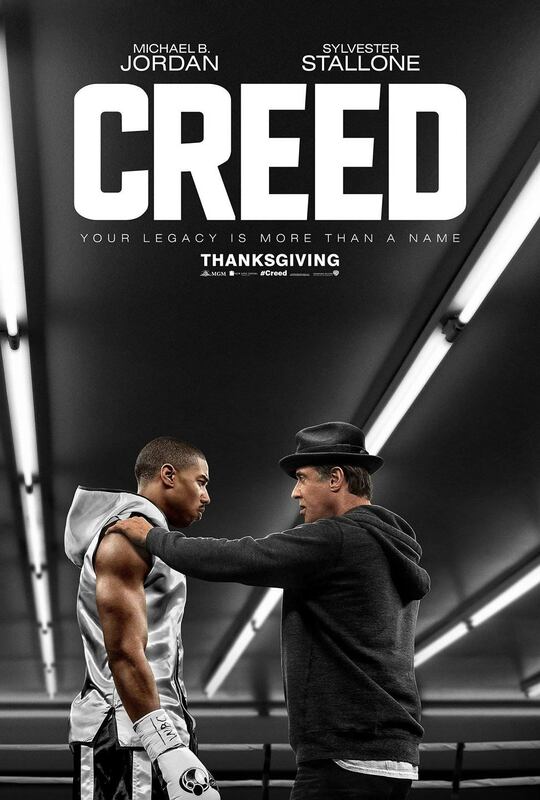 Overall, Creed is a real knockout that not only reinvigorates a beloved franchise, but captures the magic of the moviegoing experience while showing how inventive the filmmaking experience can be.